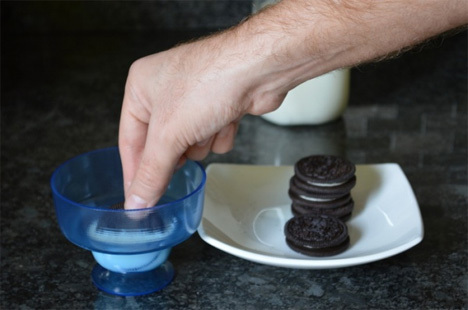 Dunking cookies in milk and eating them is about the best thing in the world, but trying to reach the very bottom of the milk glass has driven reasonable people to madness. Even worse: when there’s milk left in the bottom of the glass, but it’s too far down to dunk cookies in anymore. 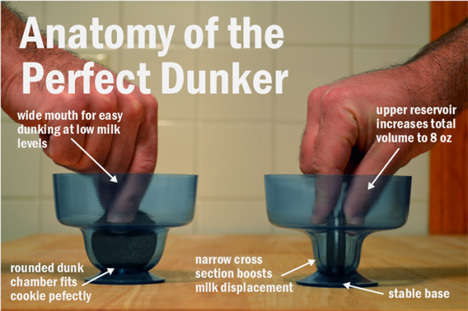 The Cookie Dunker has come along to reduce the cookie dunking woes of the masses. The small plastic cup looks a bit like a dessert dish, with its narrow bottom half and much wider top. It all sits on a wide base that makes the cup hard to tip over (which we always manage to do when enjoying cookies). This design was not a purely aesthetic choice; the top, wider portion of the cup allows you to dunk freely or even drink the milk. When the milk level gets low and fills only the bottom portion, you will find that this part of the cup is precisely the right width and depth to dunk cookies in without getting your hands wet. In fact, thanks to its perfect proportions, the milk at the very bottom is displaced just right to soak your cookie when you push it down in there. The Cookie Dunker won’t solve the big problems like climate change (probably) but it will sure contribute to a happier world so we can finally get busy solving those big problems. See more in Home & Personal or under Gadgets. April, 2013.